(3/28/10) What event could possibly get today’s teenagers out of bed at 0430 on a Sunday? An opportunity to compete in the first ever Student Angler Federation Bass Tournament in Virginia. Sunday March 28th 2010, 12 members of the Kenston Forest Kavalier Bass Assassins competed with one another in an internal school qualifier dubbed the Sandy River Showdown in Farmville, Virginia. This was the first step of the journey towards crowning the first Student Angler Federation School and individual champions. The competitors are divided into two age groups, 11-14 years old and 15-18 years old. They compete head to head against others in their age group with place finishes determined by total weight. The results in the 15-18 year old group were: 1st Place, Orrey Lloyd with 8.06 pounds and Big Fish for the Tournament , a 7.10 pound monster. 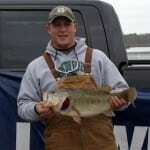 2nd Place, Austin Slatyon with 1.46 pounds, 3rd Place, Lucas Lloyd with .81 pounds. 4th place, Allison Cheely, 5th Place, Margaux Hall, 6th place, John Chipper and 7th place, Michaela McGhee. In the 11-14 year old group; 1st Place, Carl Schwabenton with 2.2 pounds, 2nd Place, Steven Baldwin with .91 pounds, 3rd Place, Willie Wright. 4th Place, Brian Chipper and 5th Place, Lex Schwabenton. Congratulations to all of our competitors. This was an awesome event even though the weather was brutally cold on the young competitors. It’s success can be attributed directly to Kenston Forest School, its enthusiastic students and supportive parents, the volunteer Boat Captains; Reuben and Chris Williams, Jason Hensley(Sandy River Bassmasters, Region 6); Ben Nice (Region 3); Ken Kirk (K2 Guide Service); Mark McGhee (Regional Pro)and Jay Strawser (Assistant Coach, KFS). KFS Team Coach and event coordinator, Michael “Doc” McGhee (Ft. Pickett Post Command Sergeant Major and National Guard Fishing Team Pro) and Tournament Director, Tim Mick who also serves as the TBF-Va State Youth Director. Additional thanks to Region 6 for use of its weigh in trailer, Haley Ford, Lowrance, FLW, the National Guard, Veterans of Foreign Wars Virginia, Wiley X and Automotive Excellence in Blackstone, Va. 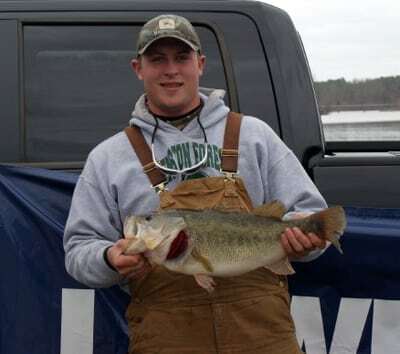 The Student Angler Federation is a new program within the ranks of the Bass Federation which brings bass competition to the middle and high school level. The TBF pillars of Youth, Conservation and Fishing sit on a foundation of Education. The SAF functions both as a fishing club with elected officers and a mission of developing students civically and as a sports team with levels of competition in Districts and the State. Kenston Forest once again demonstrated its “lead by example” philosophy and started the first Club/Team in the Buggs Island/Gaston District as well as Virginia. Since then Jefferson Forrest in Bedford has introduced another Club/Team and explosive growth is expected throughout Virginia as word of this opportunity is spread. Maryville, TN Middle School Bass Club Going Strong! Heard the phrase, “Hook, line, and sinker?” Literally speaking fisherman want the fish to swallow the bait fully- hook, line, and sinker. This old adage refers to accepting another’s point of view. It seems that Maryville Middle School in Maryville, TN has bought the idea of having a fishing club: hook, line, and sinker. 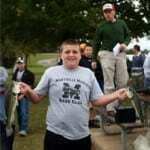 In fact they are the only middle school in the state of Tennessee with a Bass Club. In the spring of 2009 Physical Education teacher David Clark contacted Mark Gintert (National Youth Director of the Bass Federation) to inquire about Target Fishing. He generously donated ten targets to the Maryville Middle Physical Education department in hopes that the school would draw student interest to form a club. With the support of Ott DeFoe, professional fisherman with FLW Outdoors and Dave Prossor, Maryville Middle School students experienced the art of Target Fishing. DeFoe gave a short presentation to each class, demonstrated fishing, assisted students and allowed them a personal look in his boat. Dave Prossor of Academy Sports + Outdoors donated fishing equipment to the P.E. department. “I could not have organized this without the help of Mark Gintert, Ott DeFoe, Dave Prossor, and Greg Newman,” shares Clark. Through an article in the local newspaper, Newman discovered that the middle school wanted to have a Bass Club. His club, Little River Bassmasters, is now the school sponsor. “I’ve been fishing since nine years old and I think it’s very important to pass along the enjoyment of the outdoors to others. Fishing is something that anyone can do because it’s not limited to age or physical boundaries. It allows kids to get out of the house and into the outdoors and is something they can do with family or friends,” states Newman. 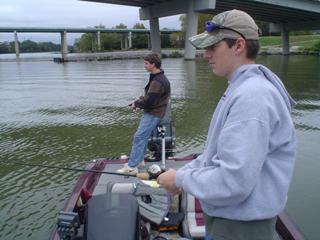 The club has 28 members and was recently awarded the largest new club membership in 2009, by The Bass Federation. Gintert with TBF will present the award to the club in April. In addition, these organizations sponsor the club: Wal-Mart, C&C Outdoors in Louisville, TN, U.S.Boat Angler, Pure Fishing, UltimateBass.com, Gemini Sports Marketing, Wired2Fish.com, Little River Bassmasters, the club’s pro angler support team, and other parent volunteers. 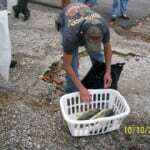 Through their help they were able to provide the club with fishing jerseys. Meetings are held monthly and include guest speakers such as pro-anglers, a TWRA Resource officer who discussed boating safety and fish care, and a how sponsorships are acquired. This year the club held two tournaments, one in the fall and spring. Twenty-four members attended the fall event at Fort Loudon Lake. With the help of professional fishermen and parents, it was a huge success. Clark’s goal for next year is to have three to four tournaments. They are looking forward to FLW Tour and the TBF Championship held in Knoxville, TN this April. The club will be involved in various activities at the events. If anyone would like more information on how to form a school bass club or would like to assist them, please visit their website or email David Clark. Oliver Springs High School TBF Angler Club kicked off its initiation tournament Saturday, October 10, 2009 at Caney Creek Watts Bar in Roane County. The club has 18 student angler members, and on Saturday 14 students, 9 boats and boat captains showed up at safe light in drizzling rain to officially initiate our club. At the 2:00 weigh in Zac Seiber came in first place with 6.56 points followed by second place Cary Gann 4.28 points and third place Dustin Mayton 3.44 points. In September Mark Gintert, TBF National Youth Program Coordinator, visited Oliver Springs High School and met with a standing room only crowd to present the program and answer questions about starting a TBF school fishing club. Excitement was great and the club was quickly formed. The TBF school sponsor is Deborah Rice. Student TBF Club President Bradley Stringfield and Vice-President Brandon Finney. The club members meet once a month during school club time and we are planning additional tournaments. Also, we are gaining new members as the word spreads about this awesome recreational activity. Community support has been great with offers of boat captains and boats and one parent has offered to provide every student member official club tee shirts. This club has caused great excitement at Oliver Springs High.